The idea that Vitamin D analogues may be considered an option for the treatment of the vitiligo arises from the casual observation of the occurrence of cutaneous perilesional hyperpigmentation after their application on psoriatic plaques together with phototherapy [6, 14, 23, 27, 28]. 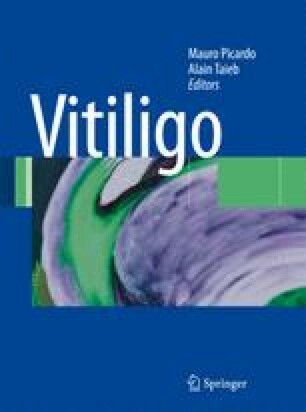 Starting from this clinical evidence, several in vitro and in vivo data support the therapeutic role of calcipotriol and tacalcitol for vitiligo (Table 3.2.3.1). Skin cells, including keratinocytes, melanocytes, and dermal fibroblasts possess Vitamin D receptors (VDR), the activation of which induces several genes associated with proliferation and differentiation, and with the inflammatory reaction. Exposure of human melano-cytes to Vitamin D promotes tyrosinase activity and melanogenesis, together with the up-regulation of c-Kit as well as morphological modifications, mainly increases the number and length of the dendrites. With regard to keratinocytes, Vitamin D produces differentiation, decreased proliferation, and the release of the proinflammatory cytokines IL-8 and IL-6, and increased production of IL-10. In vitiligo skin, both melanocytes and keratinocytes have been shown to possess an alteration of the Ca++ uptake and a decreased intracellular concentration of the ion, which could compromise the melanogenesis by increasing the level of reduced thi-oredoxin, which inhibits tyrosinase .